ACCESS TO GOVERNMENT INFORMATION: USING FOIA AND STATE FOI LAWS IN SUPPORT OF LAW AND POLICY ADVOCACY | April 17, 2017 | 12:00p – 1:00 |Milstein East C, Wasserstein Hall, Harvard Law School | The federal Freedom of Information Act and its state law analogs can be powerful tools for law and policy advocates in a wide range of fields. Understanding how to navigate freedom of information laws can be key to understanding facts and decision-making processes in virtually any substantive arena of government action — from environmental to education to energy, housing to health care to human rights, commerce to copyright to civil liberties. Developing expertise with the practical aspects of pursuing successful freedom of information requests can ensure advocates use these tools effectively and efficiently. This panel discussion will offer an introduction to freedom of information law and practice. Panelists Michael Morisy (cofounder of MuckRock, a non-profit, collaborative news site that provides a repository for government materials and information on how to file FOIA requests), Toby Merrill (Clinical Instructor in the Predatory Lending Practice and Director of the Project on Predatory Student Lending at HLS), and Amanda Savage (Attorney and Fellow, Project on Predatory Student Lending at HLS) will address their experiences using freedom of information laws effectively and offer a roadmap for those seeking to employ freedom of information requests in support of their work. 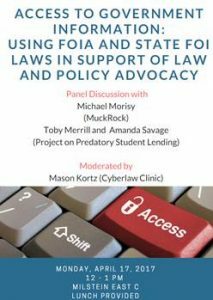 Mason Kortz, a clinical instructional fellow at the Harvard Law School Cyberlaw Clinic, will moderate the event. The event is sponsored by the Harvard Women’s Law Association, the Cyberlaw Clinic, and the Harvard Law School Office of Clinical and Pro Bono Programs. Lunch will be served — please rsvp. 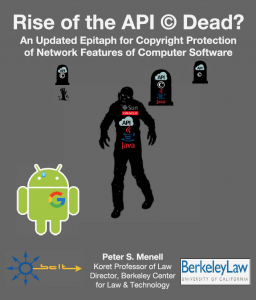 Rise of the API Copyright Dead? RISE OF THE API COPYRIGHT DEAD? AN UPDATED EPITAPH FOR COPYRIGHT PROTECTION OF NETWORK FEATURES OF COMPUTER SOFTWARE (FEATURING PETER MENELL) | WCC 1015, Harvard Law School, Cambridge, MA | 12:00 pm, March 30, 2017 | In 2010, Oracle filed a lawsuit against Google alleging that Google infringed Oracle’s copyrights in application program interface (“API”) packages relating to the Java interface. The case resulted in decisions from the United States District Court for the Northern District of California and the United States Court of Appeals for the Federal Circuit that will have far-reaching implications with respect to interoperability and the scope of intellectual property protection for the functional elements of computer code. Peter Menell is Koret Professor of Law and Director, Berkeley Center for Law & Technology, at the University of California at Berkeley School of Law (Boalt Hall). In two recent works, Professor Menell addressed the protections afforded by copyright law to network and functional features of software. 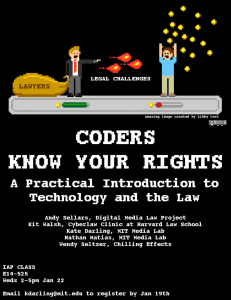 In this presentation, Professor Menell will address longstanding questions about the United States Copyright Act and the way its provisions apply to code. He will trace the history of software copyright and shed light on what the Oracle v. Google case means for the future of APIs. 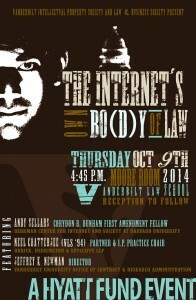 The Cyberlaw Clinic is pleased to co-present this event along with the Harvard Journal of Law and Technology. A CONVERSATION WITH SRIDHAR PRASAD | Hauser 102, Harvard Law School, Cambridge, MA | 12:00 pm, November 14, 2016 | The Cyberlaw Clinic is pleased to present a discussion with Sridhar Prasad, a manager in Bridgespan’s Boston office. 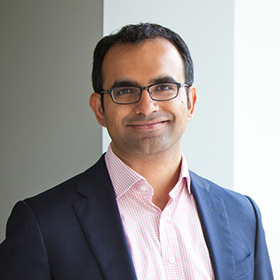 A Harvard Law School and Business School alum, Mr. Prasad works with nonprofits in a number of sectors (global development, education, mental health, and early childhood development) and is an Expert-in-Residence at the i-Lab. During the conversation moderated by Clinic Director Christopher Bavitz, Mr. Prasad will share lessons from his career since graduation and his experience in the funding and management of social ventures and other nonprofit enterprises. Lunch will be served. CCTV Presents: Media and the Elections | October 22, 2016 9:30 am – 2:30 pm | Cambridge Public Library | Cambridge Community Television is presenting a “mini conference” on “The Media and The Elections” on Saturday, October 22, 2016, at Cambridge Public Library. The event will look at political reporting during this election cycle, including issues such as media bias, traditional media vs. social media, impacts of media coverage on third-party and down-ballot candidates, and the ways in which the media landscape and tone of coverage changed moving from the primaries to the general election. Cyberlaw Clinic Managing Director Christopher Bavitz will moderate one of the day’s three panels, and the roster for the day features a wide range of knowledgeable media luminaries (including Jim Braude, Dan Kennedy, and Renee Graham). Visit the event’s Facebook page for more information and to RSVP. Artificial Intelligence and Robots Panel | October 21, 2016 1pm-2pm | Harvard Law School, WCC – Milstein East A | Please join the Clinic’s own Vivek Krishnamurthy as he moderates a panel on the legal and international development implications of artificial intelligence and robots. Vivek will be joined by Rebecca Crootof, Executive Director of the Information Society Project at Yale Law School; Margot Kaminski an Assistant Professor at the Ohio State University Moritz College of Law; Jessie Mooberry, Vice-Director of Uplift Aeronautics; and Mary Wareham, Advocacy Director of the Arms Division of Human Rights Watch. This panel is part of the Harvard Law and International Development Society’s Fall Symposium on Technology and Development. 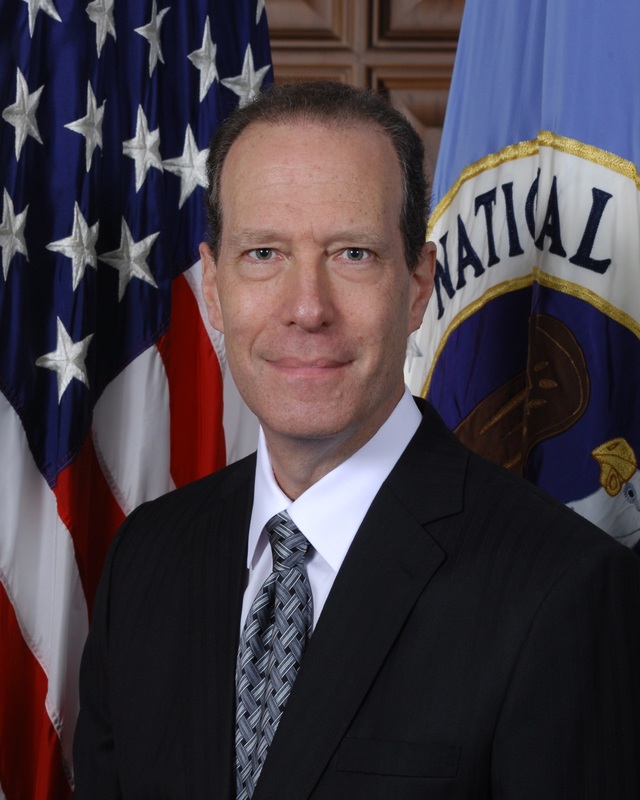 A Conversation with the General Counsel of the National Security Agency | October 6, 2016 12pm-1pm | Harvard Law School, WCC – Milstein East A | NSLA, NSJ, JOLT, the Cyberlaw Clinic, and OPIA invite you to participate in a conversation with Mr. Glenn Gerstell, General Counsel of the National Security Agency. 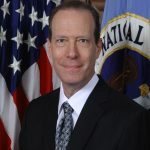 Mr. Gerstell has served as the NSA’s General Counsel since August 2015. 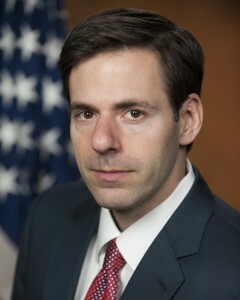 As General Counsel, Mr. Gerstell is a key member of the NSA’s senior leadership team. He is responsible for legal oversight of all NSA activities to ensure that NSA operations are lawfully conducted in accordance with the Constitution, statutes, executive orders, and applicable regulations. Prior to joining NSA, Mr. Gerstell practiced law for almost 40 years at Milbank, Tweed, Hadley & McCloy LLP, where he served as managing partner of the firm’s Washington, D.C., Singapore, and Hong Kong offices. 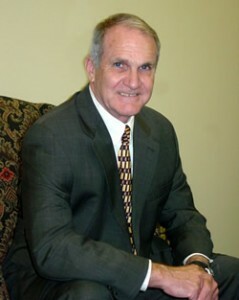 Earlier in his career, he was an Adjunct Law Professor at the Georgetown University Law Center and New York Law School. A graduate of New York University and Columbia Law School, Mr. Gerstell is a member of the American Academy of Diplomacy and the Atlantic Council, and a Life Member of the Council on Foreign Relations. A Harvard ID is required for attendance, and lunch will be served. 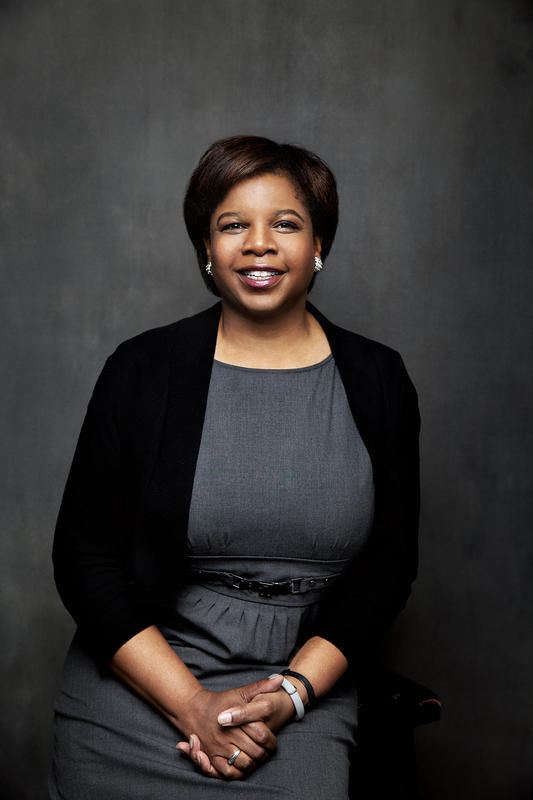 Single Stop: A Conversation with Angela Dorn | Harvard Law School, Cambridge, MA, Hauser 102 | 12:00 pm, September 19, 2016 | Please join Angela Dorn for a conversation about launching and managing a social venture, based on her experience at Single Stop, which uses technology and programmatic expertise to help millions of Americans living in poverty get resources they need to live better lives. Angela is a Founding Member and Chief Legal Officer of Single Stop. 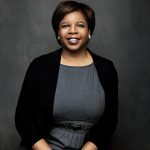 In her capacity as a founding executive of Single Stop, she worked on forward thinking strategies to create revenue models, and a path for expansion and sustainability. Angela is a graduate of Harvard College and Harvard Law School. Co-sponsored by the Cyberlaw Clinic, the Black Law Students Association, and the Journal of Law & Technology. Lunch will be served. Debating the “Right to be Forgotten,” Trans-Atlantic Data Flows, and the World’s Toughest New Privacy Laws | Harvard Law School, Cambridge, MA, Room WCC 1010 | 3:00 pm, December 4, 2015 | Google’s Global Privacy Counsel, Peter Fleischer, will share anecdotes and perspectives from his years of practice, going from Harvard Law School (Class of 1987) to life and work in Paris, overseeing privacy compliance and advocacy for Google around the world. 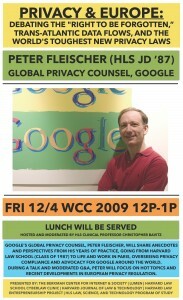 During a talk and moderated Q&A, Peter will focus on hot topics and recent developments in European privacy regulation. Lunch will be served. Please RSVP here to attend. FROM THE GROUND UP: IMMIGRATION LAW BASICS, PART TWO OF A SERIES PRESENTED BY GREENBERG TRAURIG | Harvard Law School, Cambridge, MA, Room WCC B015 | 12:00 pm, November 3, 2015 | Entrepreneurs and lawyers working with start-ups face unique challenges in launching, building and managing their business. Join lawyers from Greenberg Traurig for a two-part seminar covering key legal issues for entrepreneurs and lawyers, including IP, corporate, and immigration. The second lunch session, scheduled for November 3rd, will address: understanding how immigration laws impact you. Non-pizza lunch will be served. Panelists include Ali Brodie, Business Immigration & Compliance Group; and Kate Kalmykov, Business Immigration & Compliance Group. The Clinic is pleased to present this event in association with Greenberg Traurig and the Harvard Law Entrepreneurship Project. FROM THE GROUND UP: CORPORATE AND INTELLECTUAL PROPERTY BASICS, PART ONE OF A SERIES PRESENTED BY GREENBERG TRAURIG | Harvard Law School, Cambridge, MA, Room WCC 2009 | October 20, 2015 | Entrepreneurs and lawyers working with start-ups face unique challenges in launching, building and managing their business. Join Greenberg Traurig’s Emerging Technology Group for a two-part seminar covering key legal issues for entrepreneurs and lawyers, including IP, corporate, labor and employment and immigration. This lunch session will cover: choosing of the type of legal business entity; what it takes to attract venture and angel funding; and developing, protecting and monetizing your IP assets. Panelists include: Daniel J. Blanchard, Corporate Group; Todd Basile, Intellectual Property & Technology Group; James M. McAleenan, Intellectual Property & Technology Group. Non-pizza lunch will be served. The Clinic is pleased to present this event in association with Greenberg Traurig and the Harvard Law Entrepreneurship project. HLS LAW, SCIENCE, AND TECHNOLOGY PROGRAM OF STUDY MIXER | Harvard Law School, Cambridge, MA | October 20, 2015 | Attention HLS students and the broader HLS community: do you want to connect with others interested in technology, civil liberties, science, and health? Come out to join the Law, Science, and Technology Program of Study next Tuesday, October 20th! The Program is hosting a mixer, along with Harvard’s Berkman Center for Internet & Society and and the Petrie-Flom Center for Health Law Policy Biotechnology, and Bioethics at Harvard Law School at 4pm in the HLS Pub, where students and faculty will have the chance to network and learn about LS&T’s programs for the year. Food and drink tickets will be provided. FUNCTIONALITY AND EXPRESSION IN COMPUTER PROGRAMS: WHAT THE COURT GOT WRONG IN ORACLE V. GOOGLE | Harvard Law School, Cambridge, MA | Septmeber 24, 2015 | The Federal Circuit’s May 2014 decision holding Java application programming interfaces are copyrightable has potentially far-reaching implications with respect to interoperability and computer-to-computer communications via APIs. More broadly, the decision raises questions about the scope of copyright protection for functional elements of computer code. 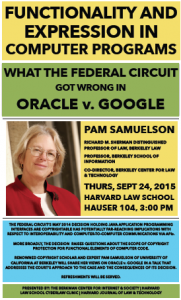 Renowned copyright scholar and expert Pam Samuelson of University of California at Berkeley will share her views on Oracle v. Google in a talk that addresses the court’s approach to the case and the consequences of its decision. The event takes place on Thursday, September 24, 2015 at 3:00 pm in Hauser Hall Room 104 at Harvard Law School. Refreshments will be served. This talk is presented by the Berkman Center for Internet & Society, Harvard Law School Cyberlaw Clinic, and Harvard Journal of Law & Technology. HOT TOPICS IN COPYRIGHT LAW: CONTENT CREATION AND DISTRIBUTION AND THE PROSPECTS FOR COPYRIGHT REFORM | Boston Bar Association, Boston, MA | June 10, 2015 | Clinical Fellow Andy Sellars and the Clinic’s Managing Director, Chris Bavitz, will join Dave Herlihy of Herlihy Law and Northeastern University for a conversation about copyright law hosted by the Boston Bar Association‘s Art, Entertainment and Sports Law Committee. The panel discussion will focus on the state of copyright law, existing legal regimes governing the creation and distribution of content, and the prospects for copyright reform. The panelists will focus their attention on music, talking about protections for musical compositions and sound recordings, compulsory vs. market-based approaches to licensing, the roles of various institutional players in the music industry (including publishers, labels, and performance rights organizations), and the scope of the fair use doctrine. The panel will also address broader concerns in the copyright and content licensing landscape, including questions about the nature of authorship and transformative works in the visual arts context. POINT TO POINT CAMP | MIT Media Lab, MIT Center for Civic Media | May 2, 2015 | Clinical Fellow Andy Sellars and others at the Berkman Center for Internet & Society, along with the ACLU of Massachusetts, MuckRock, and the MIT Center for Civic Media, have teamed up to put on the Point to Point Camp event, happening May 2, 2015 at the MIT Media Lab. 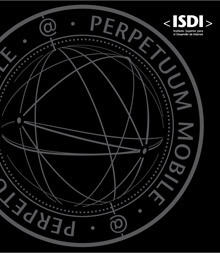 The event seeks to bring together people from the fields of technology, journalism, and law to share thoughts and resources on how to address problems around privacy, transparency, and democracy. The day will feature skillshares, project pitches, debates, and other forms of engagement designed to motivate and inspire attendees who work on these issues. Space is limited; visit the PTP Camp website for more details and to register for the event. THE RESPONSIVE CITY INITIATIVE: A PANEL DISCUSSION WITH SUSAN CRAWFORD | Tow Center for Digital Journalism, Brown Institute for Media Innovation, Columbia University | April 28, 2015 | Join incoming HLS Clinical Professor and Berkman Center Faculty Director Susan Crawford for a panel discussion that will address the topic of how a university center might advance policy making and planning for fiber optic networks that would improve local governance and support civic journalism. Susan will be joined by a panel that includes Lev Gonick (Chief Executive, OneCommunity); Brett Goldstein (Fellow in Urban Science, University of Chicago and Board Member of Code for America); Elin Katz (Consumer Council, State of Connecticut), Jim Baller (President, Baller Herbst Law Group, Co-Founder and President at Coalition for Local Internet Choice); and Oliver Wise (Director, Office of Performance and Accountability, City of New Orleans). RSVP via Eventbrite. American Bar Association Section of Labor & Employment Law, National Symposium on Technology in Labor and Employment Law | Westin St. Francis, 335 Powell Street, San Francisco, California | March 17, 2015 10:45am – 11:45am | As part of the ABA’s Symposium on Technology in Labor and Employment Law, Clinical Instructor Vivek Krishnamurthy participated in a panel addressing the growth of social media as an organizing tool and its legal impact on labor organizing globally. Vivek presented on different governments’ attempts to leverage social media, for good and for ill.
CYBERLAW CLINIC OPEN HOUSE | Harvard Law School, 23 Everett Street, Garden Level | March 27, 2015 3:00pm – 5:00pm | Interested in enrolling in the Cyberlaw Clinic next year? Stop by our offices on Friday, March 27th for an opportunity to chat with Clinic staff and current students. We’ll be on hand with refreshments and answers to your questions about our work and student experience as you make your decisions regarding 2015-2016 enrollment. 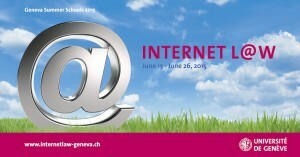 UNIVERSITY OF GENEVA INTERNET L@W SUMMER SCHOOL | University of Geneva, Geneva, Switzerland | June 15, 2015 – June 26, 2015 | Cyberlaw Clinic Managing Director Chris Bavitz will join a number of internationally-renowned experts on law and technology for the second consecutive year of the University of Geneva’s Internet L@w Summer School, in Geneva Switzerland, June 15, 2015 – June 26, 2015. Course Academic Director, Professor Jacques de Werra of University of Geneva will again lead a fantastic program that includes discussions of intellectual property, surveillance, competition law, and Internet jurisdiction (among many other topics). Chris will run sessions focused on practical aspects of cyberlaw and strategic considerations that arise when litigating Internet disputes and a session dedicated to the sale and licensing of content online. The program includes a number of people from within the Berkman Center orbit, including Berkman Faculty Director Terry Fisher (talking about “IP and the Future of Entertainment”); Berkman Fellows Neal Cohen, Primavera De Filipi, Camille François, and Kate Darling (directing a session on Emerging Legal Issues and the Internet of Things); and Professor de Werra himself (who was in residence at Berkman during the 2012-13 academic year). VIDEO GAMES, MODDING, AND THE LAW | Harvard Law School, Wasserstein 1023 | March 24, 2015 12:00pm – 1:00pm | Video game modding sees gamers challenging traditional notions of content delivery and control, permitting them to actively engage with their virtual environment instead of taking that environments as a given. But modding may bump up against the law, including the Computer Fraud and Abuse Act (which criminalizes some acts of unauthorized computer access); Section 1201 of the United States Copyright Act (which regulates circumvention of technological protection measures, including digital rights management technologies); and copyright law more broadly (raising questions about the scope of fair use protections embodied in the Copyright Act). This conversation, moderated by Cyberlaw Clinic Managing Director Chris Bavitz, will focus on the state of video game culture and the state of US law as it concerns user-driven modifications to video games. Panelists include Clinical Fellow Andy Sellars, EFF’s Director of Copyright Activism Parker Higgins, and HLS Student and Berkman Affiliate Kendra Albert. Lunch will be served. WEROBOT 2015, “Legal and Ethical Issues in the Use of Telepresence Robots: Best Practices and Toolkit” | University of Washington School of Law, William H. Gates Hall | April 10, 2015, 3:15 pm – 4:15 pm | Cyberlaw Clinic Managing Director Chris Bavitz and spring 2015 Clinic students Cecillia Xie and Jack Xu, along with Chelsea Barabas of the MIT Center for Civic Media, will present a working draft of their toolkit on legal and ethical concerns regarding the use of telepresence robots to the 2015 WeRobot conference in Seattle. The team will speak with discussant Laurel D. Riek of University of Notre Dame about the project. Telepresence robots allow users to attend meetings and events to interact with participants remotely and have significant applications in the work, school, and conference settings. The Clinic has been working with Chelsea, together with Berkman Fellow and MIT Media Lab PhD student J. Nathan Matias, to maximize opportunities and navigate legal and regulatory challenges associated with telepresence robotics. SXSW MUSIC 2015: RIGHTS MANAGEMENT AND COLLECTIVE LICENSING ORGANIZATIONS | Austin Convention Center, Room 10A | March 19, 2015, 5:00 pm – 6:00 pm | As more creators and independent entities control music rights, and as more digital services need rights to distribute music, one might expect intermediaries to play a major role in the licensing of compositions and recordings. But technology has enabled rights owners and licensees to bring in-house expertise required to manage licensing and payment of royalties. With publishers threatening to pull repertoire from PROs, and services like SiriusXM threatening to circumvent SoundExchange, the future of these kinds of organizations is unclear. Clinic Managing Director Chris Bavitz will moderate a panel featuring Allen Bargfrede of Berklee College of Music and Rethink Music, Åsa Carild of STIM, and Christine Pepe of ASCAP, seeking to analyze the state of rights management and collective licensing organizations and their role in the licensing landscape. 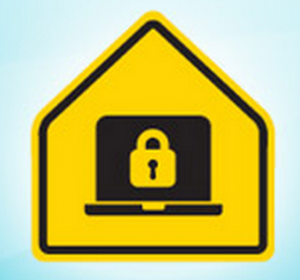 SXSW EDU 2015: DESIGNING FOR STUDENT PRIVACY 3.0 | Hilton Austin Downtown Salon E 500 East 4th Street| March 9, 2015, 1:30 pm – 2:30 pm | As part of the Student Privacy Initiative at the Berkman Center for Internet & Society, Cyberlaw Clinic Assistant Director Dalia Topelson and the Berkman Center’s Paulina Haduong engaged participants in discussion and design-based activities around future challenges (e.g., interoperability with government platforms) and opportunities (e.g., digital dossiers) at the intersection of student privacy and EdTech. HARVARD LAW SCHOOL COMMITTEE ON SPORTS & ENTERTAINMENT LAW 2015 SYMPOSIUM: THE FUTURE OF CONTENT DELIVERY | Milstein East Rooms A & B in Wasserstein Hall, Harvard Law School | March 26, 2015, 1:30 pm – 2:30 pm | At the 2015 CSEL Symposium, leaders in the entertainment industry will explore how the recent expansion of digital platforms has changed their jobs. Cyberlaw Clinic Managing Director Chris Bavitz will moderate a discussion among panelists Rebecca Borden, SVP Associate General Counsel and Co-Head of the IP Group for CBS; Kevan Choset, Legal Counsel for Spotify; Julian Petty, partner at Nixon Peabody; Bradley Silver, Assistant General Counsel & Chief Copyright Counsel for Time Warner; and Bryan Tallevi, Senior Counsel & Executive Director for NBC Universal. 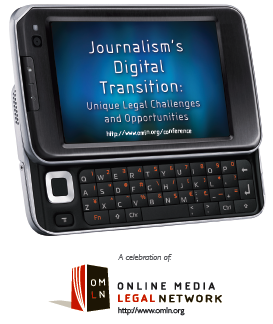 Specific issues to be discussed include protecting intellectual property in digital distribution deals, piracy, challenges in creating live content, and predictions about where the industry is headed and what the industry’s future means for lawyers. 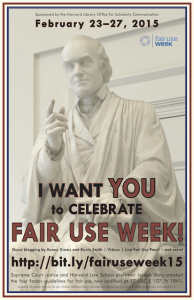 Fair Use Week Panel | Harvard University, Dudley House Common Room | February 26, 2015, 10:00 am – 11:30 am | As part of Fair Use Week 2015, a series of events created to celebrate the role of “fair use” in intellectual property law for advancing the arts and sciences, Clinical Fellow Andy Sellars will take part in a panel discussion on its importance. Andy will be joined by Peter Hirtle, Berkman Center Research Fellow and Senior Policy Advisor to the Cornell University Library, and Ellen Duranceau, Program Manager for MIT’s Office of Scholarly Publishing, Copyright & Licensing. 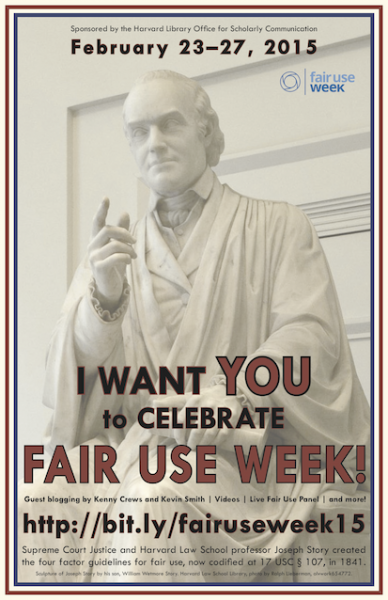 Come for an engaging discussion of the role of fair use in the law, academia, and more! ClinicTalks 2015: Learn More about the Cyberlaw Clinic! ClinicTalks 2015: Cyberlaw Clinic | Harvard Law School, Wasserstein Hall, Room WCC 4059 | February 12, 2015, 12:00pm – 1:00 pm | Are you eager to explore issues relating to copyright and new media? 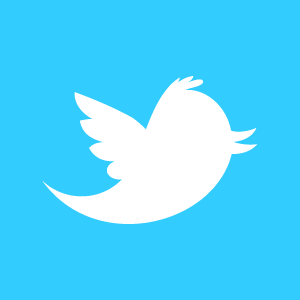 Passionate about privacy, youth online safety, and digital civil liberties? Interested in how government can use technology to promote innovation and access to justice? Do you want to help startups, software developers, advocacy groups, researchers, and others achieve their business goals and social missions online? 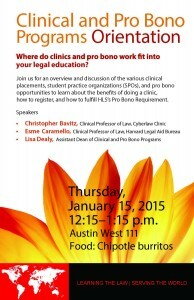 1Ls and 2Ls are invited to join Clinic Managing Director Christopher Bavitz and the rest of the Cyberlaw Clinic staff to learn more about the Clinic’s work and the opportunities available to students. Clinic registration will take place on April 2nd and 3rd, and interested students are encouraged to come with questions regarding day-to-day activities, eligibility, and registration. Lunch will be served. INNOVATING IN THE OPEN | Harvard Law School, Wasserstein Hall, Room WCC 1010 | January 29, 2015, 3:30pm – 4:30 pm | Efforts to innovate and promote innovation often proceed in black boxes, out of concern for intellectual property protection and first-mover advantage.An alternative model, however, prioritizes engagement with users, consumers, competitors, and the general public throughout the creative process. Devotees of this more open approach to innovation view the risks of early disclosure as outweighed by the benefits of drawing on the wisdom of the crowd. The Cyberlaw Clinic and the Berkman Center for Internet & Society — along with the Harvard Innovation Lab, the HLS Food Law and Policy Clinic, and the Harvard Business School Digital Initiative — are pleased to present this panel discussion. 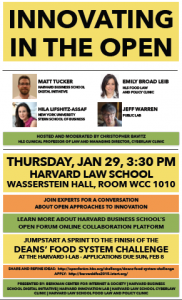 The event will feature Matt Tucker from the HBS Digital Initiative (talking about the Open Forum platform), Hila Lifshitz-Assaf from NYU’s Stern School of Business, Jeff Warren from Public Lab, and Emily Broad Leib from the HLS Food Law and Policy Clinic, in a discussion moderated by the Cyberlaw Clinic’s Chris Bavitz. Panelists will address the topic of open innovation and how it can be used to improve development of everything from consumer products and services to software code to policy proposals. The event will cover the topic from theoretical and practical perspectives and will inform the audience about ways to get involved in open innovation at Harvard, including through the Deans’ Food System Challenge (share ideas here; apply here). 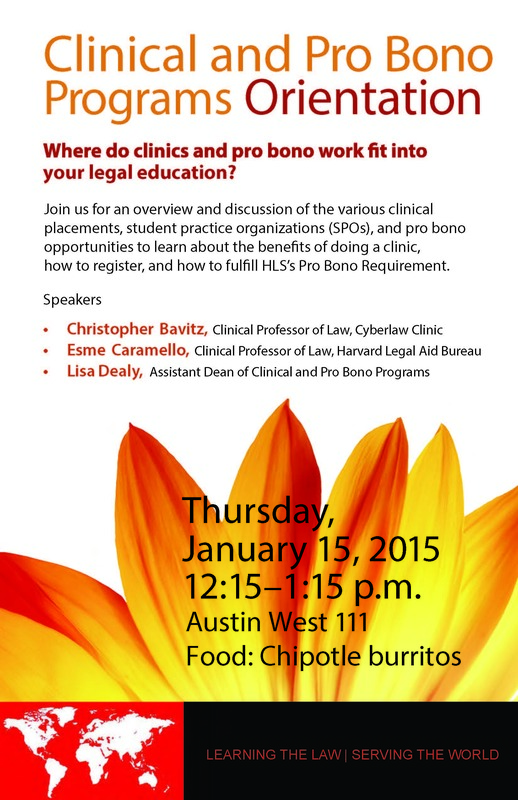 CLINICAL AND PRO BONO PROGRAMS ORIENTATION | Harvard Law School, Austin Hall West Room 111| January 15, 2015| Cyberlaw Clinic Managing Director Chris Bavitz, along with colleagues Esme Caramello of the Harvard Legal Aid Bureau and Lisa Dealy of the Office of Clinical and Pro Bono Programs, will provide an overview of the many opportunities to fit clinical and pro bono work into a legal education. The discussion will cover the benefits of doing a clinic, how to register, the hands-on learning opportunities the clinics and student practice organizations provide. Join us for an informative discussion. Lunch will be served. EMERGING ISSUES IN SOCIAL MEDIA LIABILITY | Suffolk University Law School | November 14, 2014 | Cyberlaw Clinic Managing Director Chris Bavitz will speak at the November 14, 2014 conference, “Emerging Issues in Social Media Liability.” Chris will address issues relating to government enforcement around privacy issues and will appear a panel alongside Michael Rustad of Suffolk and Kimberly Herman of Sullivan & Worcester. The full-day event will feature a number of experts in the social media and tech space, including David E. Morris of TripAdvisor, Paul Levy of Public Citizen, and David Kluft of Foley Hoag. NATIONAL SECURITY AND CYBERTHREATS: A CONVERSATION WITH JOHN CARLIN, ASSISTANT ATTORNEY GENERAL FOR NATIONAL SECURITY | Harvard Law School, Wasserstein Hall Room 2004 | October 10, 2014 | In today’s interconnected world, threats to national security have grown to include cyberthreats — attempts to access the sensitive data, electronic infrastructure, and resources stored on America’s computers. Such plots can originate from a variety of sources and take a variety of forms — from ad hoc efforts of individual hackers, to campaigns waged by terrorist cells, to “cyber espionage” initiatives undertaken by nation states. Join Assistant Attorney General for National Security, HLS alumnus and Heyman Fellow John Carlin, together with moderator Jonathan Zittrain, for a conversation about significant national security cyber issues and the tools available in the United States to address them. Mr. Carlin will share his expertise and field questions from the audience. Refreshments will be served. This event is co-sponored by the Berkman Center for Internet & Society, the Cyberlaw Clinic, the Journal of Law and Technology, the Harvard National Security & Law Association, the HLS Heyman Fellowship Program, and the HLS Office of Public Interest Advising. Please RSVP here to attend. 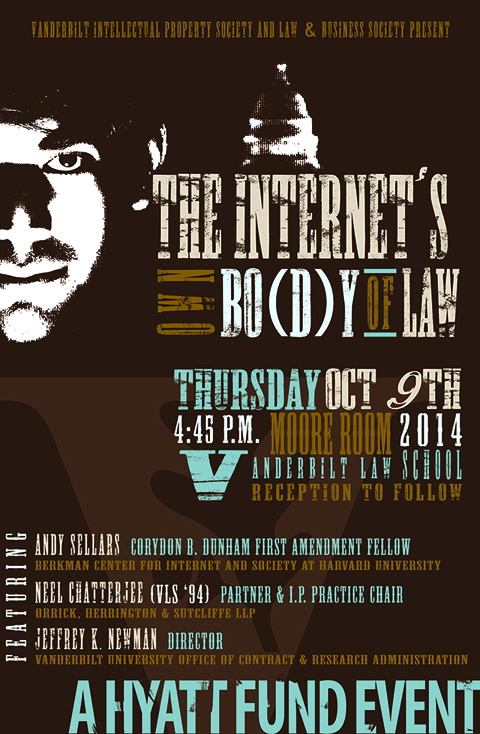 THE INTERNET’S OWN BO[D]Y [OF LAW] | Vanderbilt Law School, Nashville, TN | October 9, 2014 | Clinical Fellow Andy Sellars of the Cyberlaw Clinic will join Neil Chaterjee (partner and intellectual property practice chair at Orrick, Herrington & Sutcliffe LLP) and Jeffrey K. Newman (Director of the Vanderbilt University Office of Contract & Research Administration) for an event entitled “The Internet’s Own Bo[d]y [of Law]” at Vanderbilt on October 9, 2014. This Hyatt Fund event is presented by the Vanderbilt Intellectual Property Society and Law & Business Society. It will feature excerpts from the film, “The Internet’s Own Boy,” which chronicles the life of Internet activist Aaron Swartz. Participants in the panel will discuss the state of Internet law, with a particular focus on the law surrounding research activities, as well as other issues raised by the film. KURT OPSAHL ON NATIONAL SECURITY LETTERS | Harvard Law School, WCC 3019 | September 19, 2014 | Several federal statutes authorize the Federal Bureau of Investigation to issue National Security Letters — administrative subpoenas that require companies to disclose customer information relevant to national security investigations. In March 2013, the United States District Court for the Northern District of California held that gag order provisions in the NSL statute violated the First Amendment and that judicial review procedures violate separation of powers, declaring the entire statute unconstitutional. The court stayed its order pending the government’s appeal. The unnamed ISPs challenging the statute are represented by the Electronic Frontier Foundation. 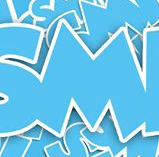 In the wake of recent leaks on national security activities vis a vis major online service providers, non-disclosure provisions in NSLs have come to the forefront of the national conversation on transparency for service providers and due process for their customers. 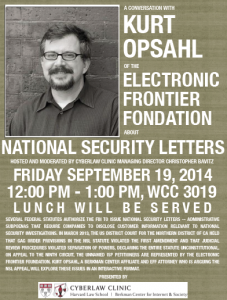 Join us on Friday, September 19, 2014 from 12:00 pm until 1:00 pm in WCC 3019 for a conversation with Kurt Opsahl, a Berkman Center Affiliate and EFF attorney who is arguing the NSL appeal. Kurt will explore these issues in an interactive format during a session hosted and moderated by Christopher Bavitz of the Cyberlaw Clinic. Lunch will be served. Will Cyber-Education Replace the Harvard Campus? WILL CYBER-EDUCATION REPLACE THE HARVARD CAMPUS? | Geneva, Switzerland | June 24, 2014 | On June 24, 2014, Harvard alumni in Geneva are invited to join the Clinic’s Managing Director Christopher Bavitz and Berkman Center Faculty Director Terry Fisher for a discussion of online education and clinical legal education in the United States. The conversation will focus on Harvard Law School’s experiences with these two modes of law teaching, drawing on Terry Fisher’s experience teaching the CopyrightX online course and Chris Bavitz’s experience running the Cyberlaw Clinic, HLS’s technology and intellectual property clinical program (based at the Berkman Center for Internet & Society). HARVARD BUSINESS SCHOOL DIGITAL INITIATIVE BETA SUMMIT | Harvard Business School, Boston, MA | April 28, 2014, 4:00 – 8:00 | Cyberlaw Clinic Managing Director Chris Bavitz will participate in the Harvard Business School Digital Initiative Beta Summit on April 28th. Organized by the students of the Digital Innovation and Transformation course and the staff of the new Digital Initiative at HBS, the #digHBS Beta Summit aims to convene a community to explore the challenges of digital transformation. The community includes DIT students; other HBS, Harvard, and MIT students; scholars; practitioners; and digital rabble-rousers. Chris will join Mark Kates of Fenway Recordings and Jim Lucchese of The Echo Nest in a conversation about the state of the digital music industry. 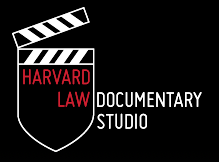 MEDIA ADVOCACY 101: HOW LAWYERS CAN DEVELOP TACTICALLY SOPHISTICATED MEDIA PROJECTS | Harvard Law School, WCC 3018, Cambridge, MA | April 16, 12:00 – 1:00 | The Harvard Law Documentary Studio, along with the Cyberlaw Clinic, is pleased to present a panel discussion about lawyers’ use of media. Featuring filmmakers and human rights attorneys, the event will focus on use of video and film in gathering evidence and otherwise supporting advocacy. UNIVERSITY OF GENEVA INTERNET L@W SUMMER SCHOOL | University of Geneva, Geneva, Switzerland | June 16, 2014 – June 24, 2014 | Cyberlaw Clinic Managing Director Chris Bavitz will join a number of internationally-renowned experts on law and technology for the University of Geneva’s Internet L@w summer school June 16th – 24th. The Course Directors, Professor Jacques de Werra of University of Geneva and Dr. Thomas Schultz of King’s College London, have put together a phenomenal program that will include discussions of intellectual property, freedom of expression, and Internet governance (among many other topics). Chris’s sessions will focus on practical aspects of cyberlaw and strategic considerations that arise when litigating Internet disputes. The program includes a number of people from within the Berkman Center orbit, including the Center’s Faculty Director Terry Fisher (talking about “IP and the Future of Entertainment”), former Fellow Dr. Melanie Dulong de Rosnay (on the subject of “Creative Commons and Open Culture in the Digital Age: Legal Features and Challenges”), and Professor de Werra himself (who was in residence at Berkman during the 2012-13 academic year and remains a Faculty Associate). 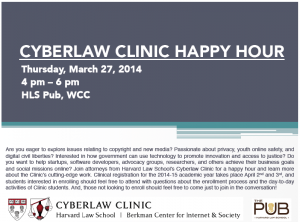 CYBERLAW CLINIC HAPPY HOUR | HLS Pub, Cambridge, MA | March 27, 2014 | Are you eager to explore issues relating to copyright and new media? Passionate about privacy, youth online safety, and digital civil liberties? Interested in how government can use technology to promote innovation and access to justice? Do you want to help startups, software developers, advocacy groups, researchers, and others achieve their business goals and social missions online? Join attorneys from Harvard Law School’s Cyberlaw Clinic for a happy hour and learn more about the Clinic’s cutting-edge work. Clinical registration for the 2014-15 academic year takes place April 2nd and 3rd, and students interested in enrolling should feel free to attend with questions about the enrollment process and the day-to-day activities of Clinic students. And, those not looking to enroll should feel free to come just to join in the conversation! THE BOSS & COUNSEL: A CONVERSATION BETWEEN REPUTATION.COM’S CEO AND GENERAL COUNSEL | Harvard Law School, Cambridge, MA | March 26, 2014 | Harvard Law School Dean Martha Minow invites you to “The Boss and Counsel,” conversation between Reputation.com’s CEO Michael Fertik and the company’s General Counsel Christopher Sundermeier. 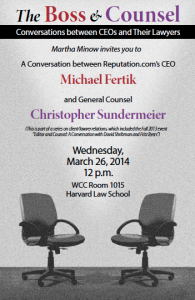 This event is part of an HLS series on client/lawyer relations featuring CEOs and their lawyers. Michael Fertik of Reputation.com is an alum of Harvard College and Harvard Law School and currently serves as one of HLS’s designated Experts in Residence at the Harvard Innovation Lab. The event will take place on Wednesday, March 26, 2014 at 12:00 noon in WCC 1015. PRACTICAL ISSUES FACING EARLY-STAGE TECH COMPANIES | RightsCon, San Francisco, CA | March 4, 2014 | Clinical Instructor Dalia Topelson will join attorneys from law firm Foley Hoag at this year’s RightsCon conference in San Francisco for a session on practical issues facing early-stage tech companies. The panel discussion will focus on the legal landscape governing the information that startups process on behalf of their users and will present some of the takeaways from a forthcoming guide to be published by Foley Hoag and the Cyberlaw Clinic. The panelists will also conduct a Q&A session, dispensing practical advice that startups can implement to minimize their legal and reputational risks. RightsCon registration information is available on the event site. SCHOOL PRIVACY ZONE SUMMIT: PROTECTING STUDENT DATA FROM THE CLASSROOM TO THE CLOUD | Common Sense Media, Washington, DC | February 24, 2014 | Common Sense Media and the Annenberg Retreat at Sunnylands are hosting a summit focused on protecting student privacy as educators move more information into the cloud. Clinical Instructor Dalia Topelson will join policymakers, educators, technologists and advocates for a discussion on student privacy as education institutions are using online and mobile platforms to enhance student’s experience in the classroom. The panel discussion will focus on the challenges schools face in adopting new technologies in light of existing regulations, and the desire to protect one of our most vulnerable populations. THE RISE OF FAIR USE? A LOOK AT THE STATE OF THE FAIR USE DEFENSE | Suffolk University Law School, Boston, MA | February 27, 2014 | Cyberlaw Clinic Managing Director Chris Bavitz will participate in this panel discussion about the state of the fair use defense, presented by the New England Chapter of the Copyright Society of the USA. The panel will feature attorney Glenn Pudelka of Edwards Wildman and Suffolk Law Professor Jessica Silbey and will be moderated by Mark Fischer of Duane Morris. Panelists will discuss the state of the fair use doctrine through the lens of significant recent fair use decisions such as the Google Books case; Cariou v. Prince; Authors Guild v HathiTrust; and Cambridge University Press et al. v. Becker et al. (i.e., the “Georgia State” case). 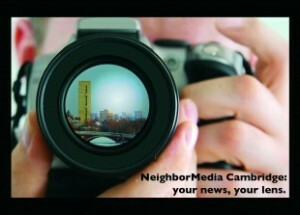 Visit the event page at the Copyright Society website for more information and to RSVP. 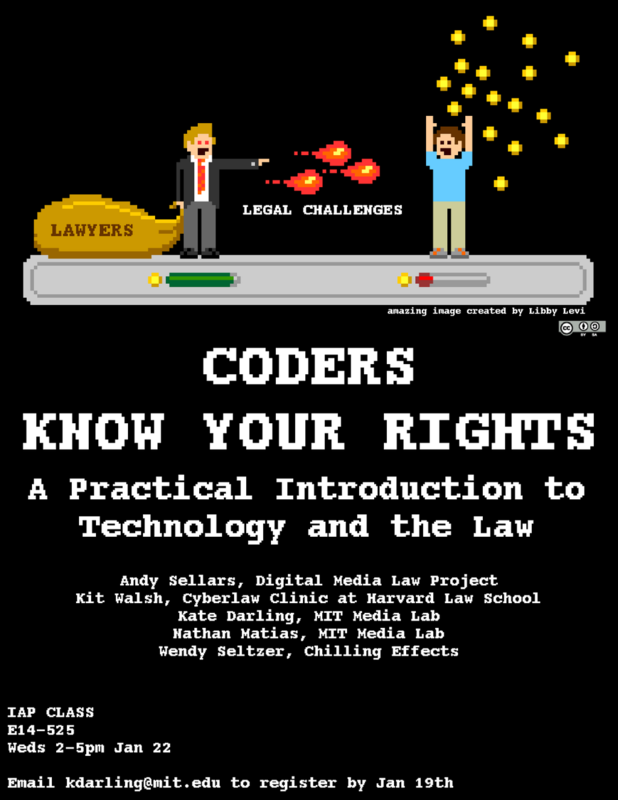 CODERS KNOW YOUR RIGHTS: A PRACTICAL INTRODUCTION TO TECHNOLOGY AND THE LAW | Massachusetts Institute of Technology, Cambridge, MA | January 22, 2014 | Clinical Instructional Fellow Kit Walsh will join Andy Sellars of Berkman’s Digital Media Law Project, Kate Darling and Nathan Matias of the MIT Media Lab, and Wendy Seltzer of Chilling Effects for this MIT “Independent Activities Period” class session about legal issues relevant to coders and others who interact with technology in their work. Space is limited and priority is given to those in the MIT and Harvard communities. Those interested in attending should reach out to Kate Darling at kdarling@mit.edu. A CONVERSATION WITH MICHAEL FERTIK ABOUT ENTREPRENEURSHIP, INNOVATION, AND ONLINE REPUTATION MANAGEMENT | Harvard Law School, Cambridge, MA | December 3, 2013 | The Cyberlaw Clinic – along with Harvard’s Journal of Law and Technology, the Harvard Law Entrepreneurship Project, the Harvard Innovation Lab, and the HLS Office of Career Services – is pleased to present a Conversation with Michael Fertik, founder of reputation management service Reputation.com. The discussion will concern Enterpreneurship, Innovation, and Online Reputation Management. The event will take place on Tuesday, December 3, 2013 at 12:00 noon in WCC 3007. Lunch will be served. 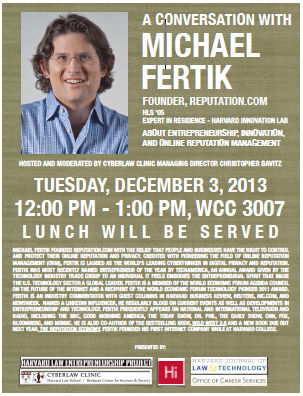 Mr. Fertik is an HLS alum and an Expert in Residence at the Harvard Innovation Lab. In a discussion hosted and moderated by Cyberlaw Clinic Managing Director Christopher Bavitz, Mr. Fertik will offer his perspective and advice for students interested in entrepreneurship. AMERICAN CONSTITUTION SOCIETY NORTHEAST REGIONAL STUDENT CONVENING | Harvard Law School, Cambridge, MA | November 17, 2013 | Cyberlaw Clinic Managing Director Christopher Bavitz will moderate a panel, “Equality in the Internet Age: Privacy Law, Data Access, and the NSA,” at the American Constitution Society‘s Northeast Regional Student Convening. Featured panelists will include Judge James G. Carr (U.S. District Court, Northern District of Ohio), Andrew Crocker (Electronic Frontier Foundation), and Alex Abdo (American Civil Liberties Union). Visit this page for more information and to register for the event. A CONVERSATION WITH JOHN WILLIAMS ABOUT ENTREPRENEURSHIP, INNOVATION, AND ADVISING NONPROFITS AND MISSION-ORIENTED ORGANIZATIONS | Harvard Law School, Cambridge, MA | November 13, 2013 | The Cyberlaw Clinic — along with Harvard’s Journal of Law and Technology, the Harvard Law Entrepreneurship Project, the Harvard Innovation Lab, and HLS’s Office of Career Services — are pleased to present a Conversation with John Williams about Enterpreneurship, Innovation, and Advising Nonprofits and Mission-Oriented Organizations. This event will take place on Wednesday, November 13, 2013 at 12:00 noon in WCC 3019. Lunch will be served. 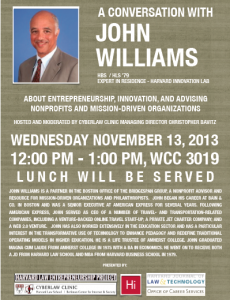 John Williams is an HLS alum and an Expert in Residence at the Harvard Innovation Lab. In a discussion hosted and moderated by Cyberlaw Clinic Managing Director Christopher Bavitz, Mr. Williams will offer his perspective on his career and advice for students interested in entrepreneurship, with a focus on his work with nonprofits and mission-oriented organizations. 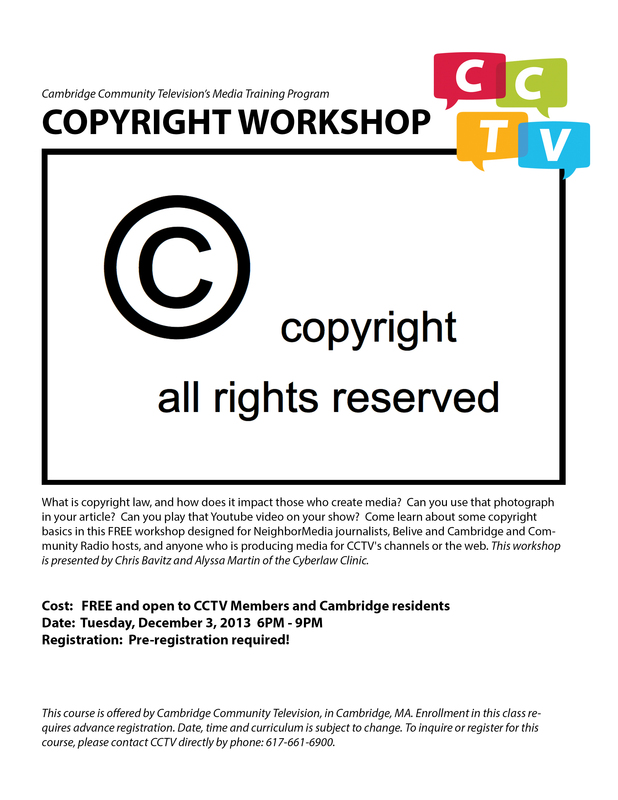 CCTV COPYRIGHT WORKSHOP | Cambridge Community Television, Cambridge, MA | December 3, 2013 | Fall 2013 Cyberlaw Clinic student Alyssa Martin and Cyberlaw Clinic Managing Director Chris Bavitz will present this workshop designed for Cambridge Community Television‘s NeighborMedia journalists and others in the CCTV community. The workshop will provide an overview of basic copyright law and offer information about the scope of copyright protection, rights clearances, the fair use doctrine and the making of fair use determinations, and resources on which journalists and others may wish to draw when working with copyrighted content. 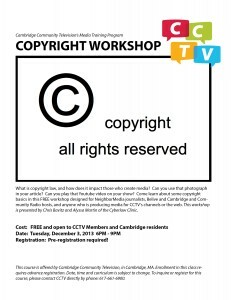 The workshop is free and open to CCTV members and Cambridge residents, but pre-registration is required. Please contact CCTV at 617-661-6900 to inquire or register. A CONVERSATION WITH EFF LEGAL DIRECTOR CINDY COHN | Harvard Law School, Cambridge, MA | October 30, 2013 | The Cyberlaw Clinic — along with Harvard’s Journal of Law and Technology, the Harvard Law Entrepreneurship Project, the Harvard Innovation Lab, and the Harvard Women’s Law Association — are pleased to present a Conversation with Cindy Cohn, Legal Director and General Counsel of the Electronic Frontier Foundation (“EFF”). This event will take place on Wednesday, October 30, 2013 at 12:00 noon in WCC 3018. Lunch will be served. 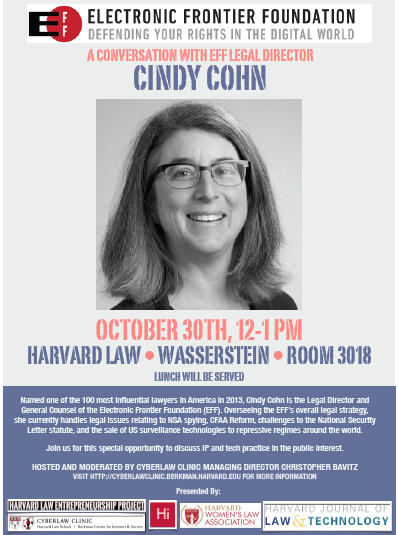 Named one of the 100 most influential lawyers in America in 2013, Cindy Cohn oversees EFF’s overall legal strategy, she currently handles legal issues relating to NSA spying, CFAA Reform, challenges to the National Security Letter statute, and the sale of US surveillance technologies to repressive regimes around the world. Join us for this special opportunity to discuss IP and tech practice in the public interest. A CONVERSATION WITH NEIL FLANZRAICH ABOUT ENTREPRENEURSHIP AND INNOVATION | Harvard Law School, Cambridge, MA | September 30, 2013 | The Cyberlaw Clinic — along with Harvard’s Journal of Law and Technology, the Harvard Law Entrepreneurship Project, and the Harvard Innovation Lab — are pleased to present a Conversation with Neil Flanzraich about Innovation and Entrepreneurship. 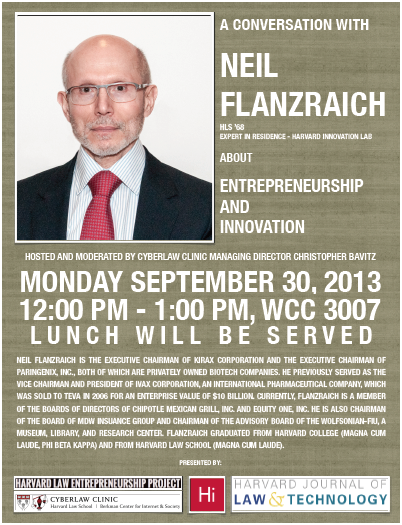 This event will take place on Monday, September 30, 2013 at 12:00 noon in WCC 3007. Lunch will be served. Neil Flanzraich is an HLS alum and an Expert in Residence at the Harvard Innovation Lab. In a discussion hosted and moderated by Cyberlaw Clinic Managing Director Christopher Bavitz, Mr. Flanzraich will offer his perspective on his career as an investor and corporate leader and advice for students interested in entrepreneurship. REAL COLEGIO COMPLUTENSE INTERNATIONAL DIGITAL BUSINESS SEMINAR | Harvard Law School, Cambridge, MA | July 12, 2013 | Cyberlaw Clinic Managing Director Christopher Bavitz addressed participants in Real Colegio Complutense‘s International Digital Business Seminar, which took place July 8-12, 2013. Mr. Bavitz and the audience of Spanish and Mexican digital business representatives discussed pragmatic approaches to copyright issues. CCTV SUMMER MEDIA INSTITUTE | Cambridge Community Television, Cambridge, MA | July 9, 2013 | Cyberlaw Clinic Managing Director Christopher Bavitz spoke to participants in Cambridge Community Television‘s Summer Media Institute about copyright law. 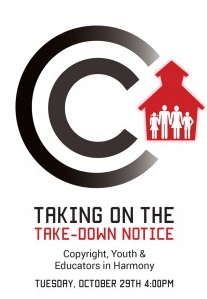 The audience of teenagers wrestled with complex questions relating to copyrightability, infringement, and fair use. TOGETHER FESTIVAL | Together Center, Cambridge, MA | May 16, 2013 | Cyberlaw Clinic Assistant Director Christopher Bavitz participated in the panel, “Copyright and Copyrwrongs,” at the 2013 Together Festival in Cambridge, MA. The panel was moderated by Andy Sellars (Digital Media Law Project) and featured fellow panelists Jessica Silbey and Eve Brown (Suffolk Law School). FILLING THE NEWS GAP IN CAMBRIDGE AND BEYOND: CITIZEN JOURNALISM AND GRASSROOTS MEDIA | Cambridge Public Library, Cambridge, MA | May 4, 2013 | Cambridge Community Television presented this half-day forum at the Cambridge Public Library on May 4, 2013. The Berkman Center’s Digital Media Law Project and Cyberlaw Clinic were pleased to be co-organizers, along with MIT’s Center for Civic Media. The event explored the quickly expanding world of citizen journalism: how technology is fueling its growth; how that growth is changing the way we see our world, enact change, and disseminate the news; and how people in communities around the world are taking the initiative to share stories that are left untold by the mainstream media. The DMLP and the Clinic participated in a workshop addressing legal issues facing those who gather news. 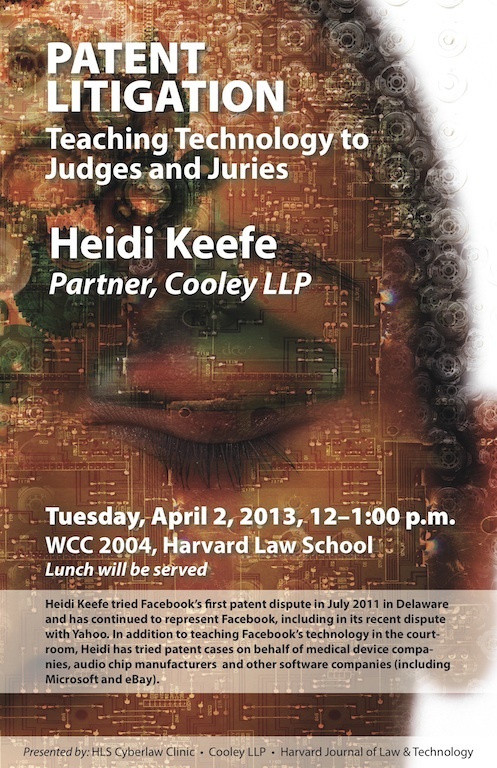 PATENT LITIGATION: TEACHING TECHNOLOGY TO JUDGES AND JURIES | Harvard Law School, Room WCC 2004 | April 2, 2013 | The Cyberlaw Clinic, along with the Harvard Journal of Law & Technology and Cooley LLP, presented this talk by Cooley partner Heidi Keefe. The talk concerned patent litigation and the challenges of teaching complex technological concepts to judges and juries at trial. Heidi Keefe tried Facebook’s first patent dispute in July 2011 in Delaware and has continued to represent Facebook, including in its recent dispute with Yahoo. In addition to teaching Facebook’s technology in the court- room, Heidi has tried patent cases on behalf of medical device companies, audio chip manufacturers and other software companies (including Microsoft and eBay). WHAT’S YOURS IS THEIRS: PRIVACY, PIRACY AND THE BIG DATA DEBATE | InterContinental Hotel at the Plaza, Kansas City, Missouri | April 19, 2013 | The 26th annual Media and the Law seminar, hosted by University of Kansas School of Law and the Kansas City Metropolitan Bar Association Media Law Committee, will take place on April 19, 2013. Cyberlaw Clinic Assistant Director Christopher Bavitz will join a range of experts on law, policy, and the media industry to discuss how the Internet’s liberating effects as a medium for First Amendment-protected expression can conflict with its potential for invading privacy and chilling speech. NEW ENGLAND REGIONAL COMPUTING PROGRAM SPECIAL INTEREST GROUP — BEHIND THE CURTAIN: DAM AND PRESERVATION SUPPORT FOR DIGITAL HUMANITIES | University of Massachusetts, Amherst, MA | February 11, 2013 | Cyberlaw Clinic Assistant Director Christopher Bavitz spoke about copyright law and legal issues facing digital archivists and librarians at this New England Regional Computing Program Special Interest Group event. The one-day program included presentations by a wide range of technologists and others involved in preservation support and archive management. USING SOCIAL MEDIA TO TRACK NATURAL DISASTERS: THE HURRICANE SANDY TEST | Harvard Law School, Cambridge, MA | February 4, 2013 | Dr. Arthur Cosby, the William L. Giles Distinguished Professor at Mississippi State University and Director of Mississippi State University’s Social Science Research Center, described his work with a team of colleagues to develop software that uses social media as a source of scientific data to track natural disasters. The Clinic co-sponsored this event, along with Harvard Law School’s Mississippi Delta Project, the Environmental Law Society, the Journal of Law and Technology, and the National Security Journal. MUSIC STARTUP ACADEMY | Cambridge Innovation Center, Cambridge, MA, November 8, 2012 | On November 8th, digitalmusic.org brought its Music Startup Academy program to the Cambridge Innovation Center, offering entrepreneurs, app developers, and music startups resources to help them break the barriers of entry into the music business. Cyberlaw Clinic Assistant Director joined representatives of the Harry Fox Agency and others to teach attendees how to better understand interactions between labels and publishing and the basics of product licensing and royalty reporting, content acquisition, business development and operations. RETHINK MUSIC | Hynes Convention Center, Boston, MA | April 23 – 24, 2012 | Cyberlaw Clinic Assistant Director Christopher Bavitz served as co-host for this two-day symposium and moderated the panel, “Ease of Use: Registry Databases,” featuring panelists Patrick Sullivan (RightsFlow); Cecily Mak (Rhapsody); Jim Griffin (OneHouse LLC); and Mark Isherwood (Rightscom). SOUTH BY SOUTHWEST | Austin Convention Center, Austin, TX | March 17, 2012 | Cyberlaw Clinic Assistant Director Christopher Bavitz participated in the panel, “The Unspoken Code of the Music Blogosphere,” at the 2012 South By Southwest conference. The panel was moderated by Jason Sigal (Free Music Archive) and featured fellow panelists Leslie Madill (Ninja Tune); David Greenwald (Rawkblog); Todd Goldstein (Arms); and Anthony Volodkin (Hype Machine). RECORDING ARTISTS v. THE RECORD INDUSTRY | Suffolk University Law School, Boston, MA | November 10, 2011 | Suffolk University’s Intellectual property Law Student Association and Sports & Entertainment Law Association presented this panel discussion regarding recording artists and termination rights under the Copyright Act. Cyberlaw Clinic Assistant Director Christopher Bavitz joined moderator Dave Herlihy (Northeastern University) and fellow panelists Mark Fischer (Duane Morris, LLP); Glenn Pudelka (Edwards Wildman); and Lita Rosario (WYZ Girl Entertainment). The panel addressed the mechanics of and policies behind the Act’s termination provision and its particular applicability to recording artists and record contracts. THE DEMOCRATIZATION OF ENTERTAINMENT | Harvard Law School, Cambridge, MA | November 11, 2011 | Cyberlaw Clinic Assistant Director Christopher Bavitz moderated a panel entitled “Who Controsl Your Digital Self: Privacy Concerns in the Digital Realm” at this 2011 symposium, sponsored by Harvard Law School’s Committee on Sports & Entertainment Law. The panel featured panelists Harley Geiger (Center for Democracy & Technology); Michael Kernan (NuMedia Studios); and David Jacobs (Electronic Privacy Information Center). RETHINK MUSIC | Hynes Convention Center, Boston, MA | April 26, 2011 | Cyberlaw Clinic Assistant Director Christopher Bavitz moderated the panel, “Licensing Difficulties,” at the 2011 Rethink Music conference in Boston, MA, featuring panelists Robert Ashcroft (PRS for Music); Stephen Block (Harry Fox Agency); Jay Fialkov (WGBH); Michael Huppe (SoundExchange); and Patrick Sullivan (RightsFlow). SOUTH BY SOUTHWEST | Austin Convention Center, Austin, TX | March 16, 2011 | Cyberlaw Clinic Assistant Director Christopher Bavitz co-moderated the panel, “Creativity, Commerce, and Policy: A Conversation,” at the 2011 South By Southwest conference, featuring co-moderator Allen Bargfrede (Berklee College of Music) and panelists Jim Eno (Public Hi-Fi / Spoon) and Sondre Lerche (Sondre Lerche, LLC). THE NEXT BIG THING: EMERGING ISSUES IN ENTERTAINMENT LAW | Harvard Law School, Cambridge, MA | November 12, 2010 | Cyberlaw Clinic Assistant Director Christopher Bavitz moderated the music panel at the 2011 Next Big Thing symposium, sponsored by Harvard Law School’s Committee on Sports & Entertainment Law, featuring panelists Stan Soocher (University of Colorado / Entertainment Law & Finance); Ray Beckerman (Ray Beckerman PC); and Allen Bargfrede (Berklee College of Music). THE CABLEVISION CASE: 2 YEARS LATER | Harvard Law School, Cambridge, MA | November 4, 2010 | The Cyberlaw Clinic and Harvard Law School’s Journal of Law and Technology sponsored a discussion about the case, Cartoon Network v. Cablevision, moderated by Cyberlaw Clinic Assistant Director Christopher Bavitz and featuring panelists R. David Hosp (Goodwin Procter LLP) and Ed Weiss (New England Sports Ventures). JOURNALISM’S DIGITAL TRANSITION | Harvard Law School, Cambridge, MA | April 9, 2010 | Cyberlaw Clinic Assistant Director Christopher Bavitz moderated the panel, “Saving Journalism from Itself? Hot News, Copyright Fair Use and News Aggregation” at the Citizen Media Law Project’s 2010 Journalism’s Digital Transition conference, featuring panelists Sam Bayard (Citizen Media Law Project); Bruce D. Brown (Baker and Hostetler LLP); Michael Grygiel (Hiscock & Barclay, LLP); R. David Hosp (Goodwin Procter LLP); and Joseph Liu (Boston College Law School). THE LIFE OF A MUSIC LAWYER AND BEYOND | Berklee College of Music, Boston, MA | Nov 17, 2009 | Cyberlaw Clinic Assistant Director appeared on this panel at Berklee College of Music, along with moderator Allen Bargfrede (Berklee College of Music) and co-panelists Mark Fischer (Fish & Richardson PC) and Jim Lucchese (The EchoNest). GOOGLE BOOKS SEARCH SETTLEMENT OPEN WORKSHOP: ALTERNATIVE APPROACHES TO OPEN DIGITAL LIBRARIES | Harvard Law School, Cambridge, MA | July 31, 2009 | The Cyberlaw Clinic helped to host this daylong workshop examining the proposed Google Book Search settlement. CHANGING INDUSTRY, CHANGING DEALS | Berklee College of Music, Boston, MA | Apr 16, 2009 | Cyberlaw Clinic Assistant Director Christopher Bavitz appeared on this panel at Berklee College of Music, along with moderator Jay Fialkov (WGBH / Berklee College of Music) and co-panelists Guy Blake (Davis Shaprio Lewit & Hayes, LLP), Derek Crownover (Crownover Tisinger PC), and Steve Shapiro (Davis Shapiro Lewit & Hayes LLP). THE GOOGLE-PUBLISHERS COPYRIGHT LAWSUIT SETTLEMENT | Berkman Center for Internet & Society, Cambridge, MA | November 12, 2008 | The Cyberlaw Clinic presented this talk by Jeffrey Cunard of Debevoise & Plimpton LLP, who served as one of the lead counsel for McGraw Hill and other publishers in their landmark copyright lawsuit against Google for its Google Library book search project. GIANT ROBOTS, CIRCUMVENTION, AND THE DIGITAL MILLENIUM COPYRIGHT ACT | Harvard University, Cambridge, MA | Sept 25, 2008 | Together with the Harvard Computer Society and the Harvard Law School Journal of Law and Technology, the Cyberlaw Clinic presented this talk by Christian Hicks of Elysium Digital about the case, StorageTek v. CHE.